Ceramic is one of the newest nonstick materials, and this griddle features the proprietary Dura Ceramic surface made from natural materials that won’t flake or peel like old-style Teflon. It’s easy to clean, but you’ll still get good browning. Plus, it’s less likely to scratch when you use a spatula under your food. The cooking surface on this griddle is 10 x 18 inches, so there’s plenty of room for cooking breakfast for a crowd, and if the crowd is even bigger, there’s a warming tray where you can stash finished foods to keep them at serving temperature while you’re busy making more on the cooking surface above. This griddle also adds some fashion to your kitchen, since it’s a candy apple red color rather than the more usual black, and the handles are designed to stay cool during cooking. A grease channel in the cooking surface sends fat and liquids into the drip tray, for less mess and easier cleanup. The temperature control goes from warm to 420 degrees, and the control is removable for easy cleaning, or for serving on the griddle without a cord dangling in the way. If cooking with a griddle is going to be an everyday occurrence, a high-end griddle might be a wise purchase. This luxury griddle has a 19 x 12.5 inch cooking surface and can heat from 176 to 425 degrees. The cooking surface has a nonstick ceramic surface that’s enhanced with titanium to make it long-lasting and easy to clean, while it promotes even browning. The griddle disassembles easily for cleaning, so you’ll get all the nooks cleaned every time. The cooking plate sits inside a body guard, which helps to prevent accidental scalding while cooking. Both the body guard and cooking plate are fully immersible for thorough cleaning. 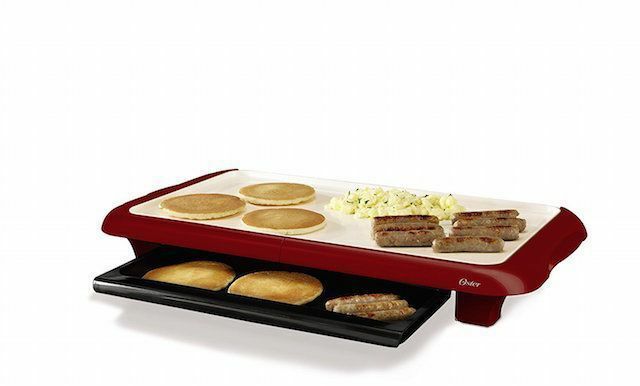 This griddle includes a lid for faster cooking, to hold in steam, and to protect against oil splattering. A stainless steel spatula is also included. If griddle cooking is only an occasional need and you’re on a budget, this affordable griddle has enough cooking space to feed your family, but it’s got an affordable price tag. The cooking surface is a generous 20 x 11 inches, which is larger than a typical cookie sheet, and it has a nonstick surface for easy cleaning. The temperature control goes from warm to 400 degrees, and there’s a removable grease cup that catches fat and juices for convenient disposal. The entire griddle is immersible for cleaning after the temperature control is removed. The drip cup slides in easily, but doesn’t snap in place, so it can slide out if the griddle is tilted if it’s moved during cooking. A large griddle is great for feeding a crowd, but if you’re cooking for one or two, this compact griddle has plenty of space for four fried eggs, a pair of steaks, or plenty of hash browns for breakfast. The cooking surface is 8 1/2 x 10 1/2 inches and has a nonstick coating for easy cleanup. The griddle has a built-in channel that catches fat and other drippings, but there is no drip tray, so you’ll need to pour it out after cooking. With the temperature control removed, the entire griddle is fully submersible for easy cleaning. The temperature goes from warm to 400 degrees, so you can use it for most of your cooking needs, whether at home, at a vacation cottage, or in a dorm room. If you need to store it in a small space when it’s not in use, the leg/handle pieces can be removed to make it more compact. If you want your griddle to do more, this grill/griddle combo has two removable and reversible plates, so can make pancakes on its smooth surface and grill steaks or burgers on the ridged grilling surface. If you’re making steak and eggs for breakfast, you can scramble eggs on a smooth surface and grill your steak on the ridged surface at the same time. Each side has its own temperature control that goes from warm to 425 degrees, so you can cook foods at two different temperatures at the same time, or use one side for cooking while the second side keeps finished foods warm for serving. There is a center grease channel that funnels the fats and juices to the dishwasher safe grease tray. The cooking plates snap into place and are dishwasher safe, for super-easy cleaning, and the total cooking surface is 18 1/4 x 9 1/2 inches, less the center channel which is about 1/4 inch wide. 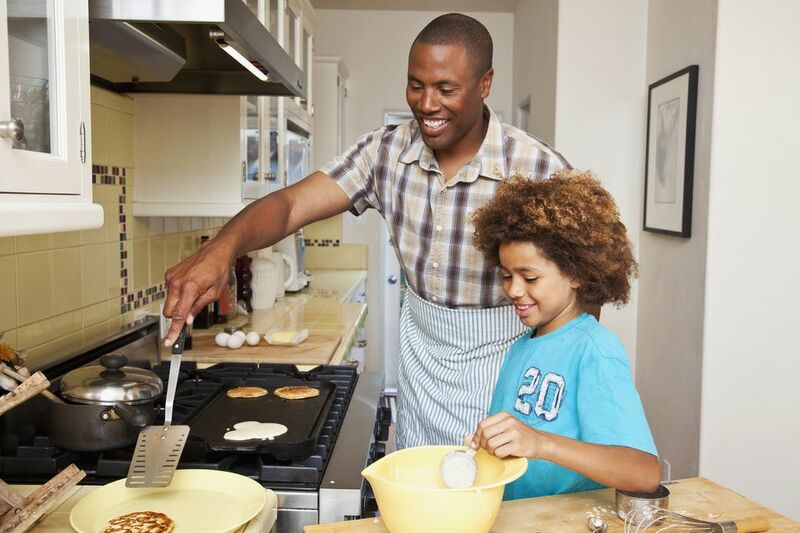 Some users have noted that the temperature marks wear off easily, so you might need to estimate the temperature or make your own marks on the dial after the griddle has been around for a while.